The past two weeks have been filled with a lot of requests and troubleshooting for our Tablet PC's and how they wirelessly connect to the projector. Currently, we have two major systems in place. For our Toshiba Tablets, we've been using Internetvue 2100 PC2TV adaptors. 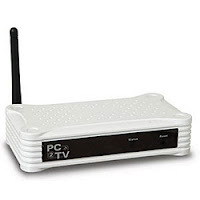 On the Tablet, a user will open a program (PC2TV) and connect wirelessly to the projector. I used this when I was teaching chemistry with a tablet last year, and I found it to be a bit clunky at times, but overall relatively stable. There was an issue with the firmware update that disabled portrait mode as a viewing option. Internetvue responded by allowing for a firmware downgrade, but that's a lot of legwork for our teachers. Consequently, I refused the firmware upgrade for a long time as a teacher, but this meant closing a message box every time I connected. I have since been upgrading the firmware and telling users that portrait mode will not be enabled.